The art of caring for figurines (your prized ornaments) is something I am often asked about by collectors. 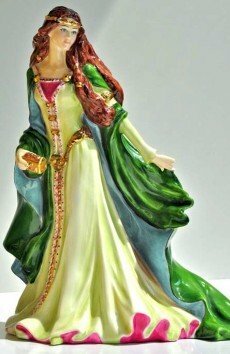 Really one of the things which makes collecting ceramic figurines a rewarding pastime is that really, you can just look at them, to get a quick uplift to your spirits and - well, not much else actually, apart from move on and enjoy your day. However, there are things you can do with little effort from time to time to preserve your collection. After all, they could be - or become in the future - quite valuable. So you should know the best way of caring for figurines and your beautiful heritage. Once you have started a collection there are some key things to think about in order to get the best out of it. You need to protect, preserve and maintain its value on the secondary market. That is what caring for figurines is all about, of course. There are figurines over two hundred years old which look as good as new. Needless to say, their value at auction or online is primary. Of course it goes without saying everyone has their own way - something they have often very carefully thought about and perfected over the years. Some swear by specialist cabinets which show off the figurines in their best light and also minimize the dust and dirt. They feel that using the right cabinet to display figurines is of utmost importance. 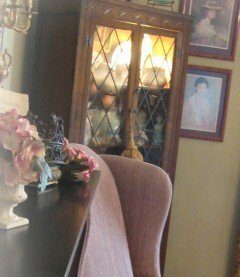 Others swear by modern cabinets which have less wood and more glass - I feel these can nowadays be more effective than the older more ornate ones as the idea is to show off the figurines - not the cabinet. I suppose I am biased on that one. Old cabinets have limited lighting, I find too. Too much dark wood surround, smaller windows and no back mirrors. Glazed bone china figurines look at their most visually striking when the light can get to their bright jewel-like glistening colours and gazes and you can see the detail at the back of the figurine with a mirrored back panel. However, there are always exceptions to the rule and I have seen some splendid displays in old ornate cabinets of collectors. Each to their own taste, as they say. 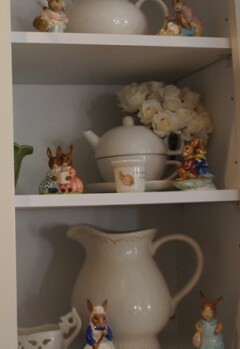 Any which way, bone china figurines are precious objects and should be treated with respect accordingly. If you have a substantial collection, you may only be able to display your collection on a rotation basis. The ones that are being stored should be wrapped and sealed in either the original box (together with certificates and paperwork) or in bubble wrap and a suitable cardboard box. Try to avoid a damp environment as this can result in mildew and mould. Never wash your figurines in the dishwasher. Dust can blown away or brushed with a large format paint brush. Cloths will not reach the reach the detailed areas, but you might get better results with a cotton bud. Or try setting a hair dryer on low to blow away the dirt. Use tepid water mixed with a just a tiny dash of detergent. Cover the air hole to avoid flooding with water. Allow the figurine to dry in the air as delicate detail can be so easily caught and dislodged even when trying to gently pat. Be aware, especially if you are in a hot place, that heat and/or damp are not the friend to bone china - and any minor imperceptible factory flaws can be exacerbated. Many collectors buy and sell their collections. Nothing wrong with a bit of savvy trading of course. These are the findings:- in order to get the highest price on the secondary market for your figurine always save original packaging, tags, certificates etc and mention these in the sales blurb. Storing the figurines in their original packaging is a good option, as mentioned above. Collectible figurines of high quality always increase in value over time. It is worth following the above tips in order to either pass them down to the next generation or sell them when the time is right.